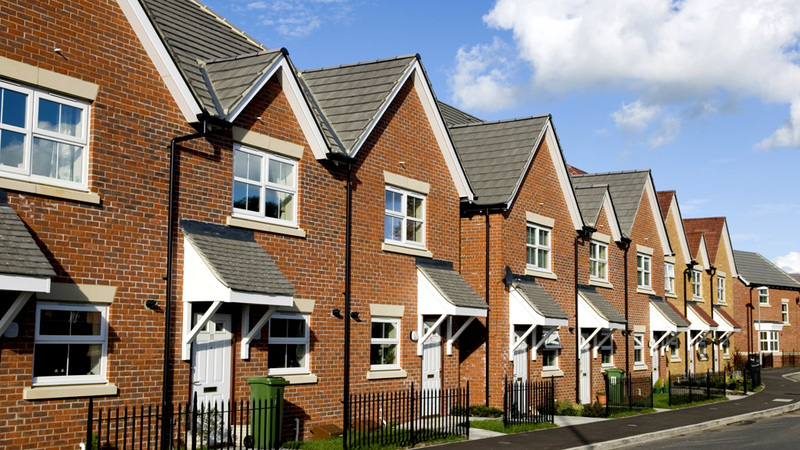 A Survation poll of 1,031 people across the UK on behalf of Capital Club has found that the British public is concerned about the current housing situation in the country and would like more of a say in the planning process. Almost three quarters (74%) of total respondents of this poll identified that there is a need for more homes to be built in the UK. These views were primarily driven by people wanting affordable housing in their local areas. 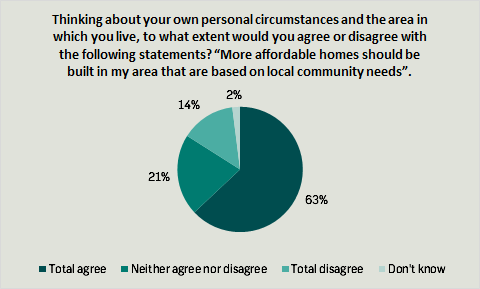 This reflects a perceived lack of affordable housing in local communities, with as many as 42% of total respondents concerned about being able to afford future accommodation in their area. Furthermore, 63% of respondents agreed with the statement ‘more affordable homes should be built in my area that are based on local community needs’. In particular younger respondents – over half of those aged under 44 – were concerned about future affordability of accommodation in their local areas. 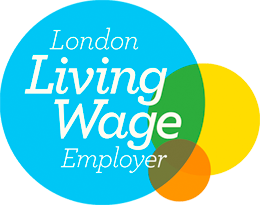 Interestingly, concern over this issue is widespread as 30% of respondents who own their own home and are best positioned in the housing market, believed it was unlikely the next generation of their family would be able to afford their own home in the future. Despite large scale concern over future affordability of housing, this poll revealed that the public have conflicting views over the impact new housing would have in their area. Whilst over half (57%) of respondents agreed more housing would lead to a strain on amenities (such as increased pressure on transport and schools), 51% agreed it would help reduce homelessness. 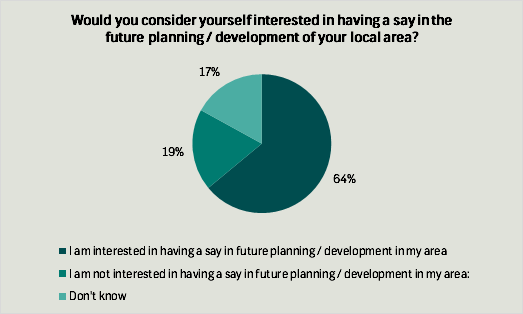 One of the key findings of this poll was the gap that exists between people’s desire to have a say in local planning and their actual involvement. Whilst 64% of respondents were interested in having a say in local planning development, just 23% actually recalled being asked for their personal views about local needs from the government or their council. 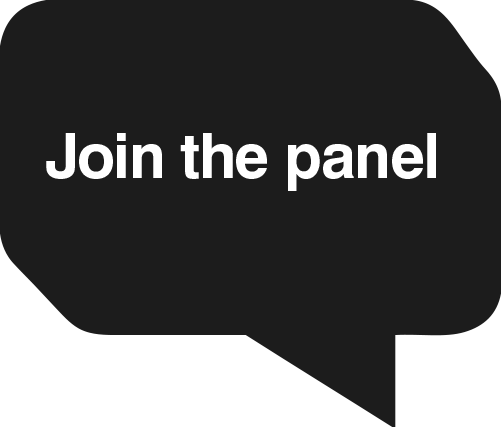 Almost one in five (19%) of total respondents said they were not interested in having a say in future planning, and when asked why, 40% of these people said it was because they believed their opinion would not make a difference to final decision making. 25% of those who were not interested in having a say said this was due to not feeling well enough informed. Not having enough access to information on planning is clearly an issue when it comes to gaining representative views of local populations. 59% of total respondents believed that if they received more information, they would be more inclined to get involved in local planning. When it comes to making decisions on housing developments, a clear majority (84%) believe that the government and local authorities should first seek out views from broad representative samples of the local population. 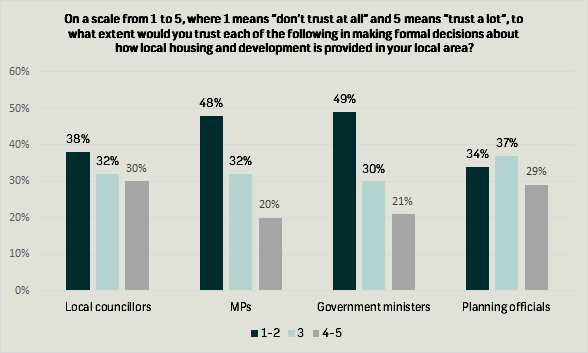 The public have low levels of trust in officials to make formal decisions about how local housing and development is provided in their local area. For example, just under half of respondents have little to no trust in MPs or Government ministers (48% and 49% respectively). 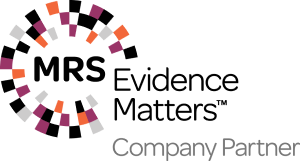 The report by Capital Club is available here. Full data tables available here. Research was conducted online with a sample of 1,031 UK Adults aged 18+. Fieldwork from 8th June 2018 – 9th June 2018. Survation are members of the British Polling Council. Daral has been a member of Survation's Project Management team since 2018, where he is responsible for liaising with clients and managing projects from inception to delivery. Prior to joining Survation, Daral worked with Shout Out UK, a youth news network, where he taught their Political Literacy Course. Hailing from Wellingborough, Daral was the first member of his family to attend university and studied Human, Social and Political Sciences at King's College, Cambridge.